Today's interview is with geometric abstract artist Stacey Messier. After interviewing Stacey it's clear that her daily life and creative work are tightly intertwined. Her abstract imagery is full of depth and representation. She sees emotions, interactions, and sounds in shapes, translating to vibrant and eye catching work. We can't wait to dive into her work this Saturday in the Field! 1. You describe your work as geometric illustrations of a feeling or statement. Do you find that you often respond to visuals over audio or kinesthesia (doing) when learning/creating/working? I find that kinesthesia follows me when I'm NOT trying to learn new things, but rather in moments when I'm purely allowed to absorb the content. When I read a book for pleasure, you'll see me seated with pen in-hand, underlining, scribbling ideas in the margins, and dog-earing pages. When I learn, I prefer to read first, look at pictures second, and watch or listen last. But, in a former part of my life, I was a singer and co-writer within various music projects. Studying voice and discovering what it means to write meaningful lyrics has always led me to be pulled in by words and phrases that evoke a distinct emotion or visual. Beauty, severity, ambiguity – these concepts ring true in how they feel on the tongue as well as the images they may conjure. 2. What feelings or statements translate to your favorite images? Do you find that more passionate feelings translate to intricate or simpler illustrations? It's not the most passionate, the strongest or most colored feelings that translate to new work. Rather, it's quite often smart mash-ups of clever words that yield some of the best imagery for my paintings. For example, currently, I'm reading a book on the science of persuasion. In one chapter, the author speaks to how much, we, the public, hate laugh tracks, and yet they work every damn time. He refers to this as "technically augmented mirth." It's so complex! And engaging! What an incredibly deft piece of vocabularian art. In my mind, I can see small grouped shapes resembling crowds, I see larger rectangles referencing the laugh track and then us, the audience, on the other side of the TV... Let's see how it shakes out in sketches. 3. Your color palette is so eye catching and cohesive across all your work. Do you use the same palette all the time or does it vary while staying complimentary? My color palette has followed me around for many, many years. There's something so satisfying about working with "gem tones," hues that sing in deep, warm notes in the proverbial cool air. This palette has also been heavily influenced by a love of midcentury shades combined with those we find around us today. Peacock feathers, chartreuse stirred into a cocktail, your grandmother's shag carpet in the basement. The other key behind the consistency of my color palette? The climate we live in today is filled with such social smog; I need colors that make me happy when I make work. I have no interest in making statements in color that match the fear around us. I create to stay balanced so that when I escape the news, I truly feel like I've left for a vibrant place I'm pleased to come back to, again and again. 4. Your process is multifaceted and with many steps! How long does the average piece take you? What mediums do you use in one piece? Small pieces (4" - 6") can take anywhere from 12 to 20 hours. Larger pieces can take a couple of months. The bigger the canvas, the longer it takes. That said, I would MUCH rather paint large than small! But I waiver between loving the portability of the "compact" and being able to use my whole body when I paint large. In terms of mediums, I paint with acrylics. I have a few glazes and thinning techniques I use, but they are quite sparse. If I can find a mason jar, water, and some paint, I'm ready to get started. 5. I love how you pair your illustrations with found and vintage objects like cork or bingo cards. Is there a relation between the statement and the canvas? Or is paired based on solely aesthetics? You are correct; often the found materials drive the direction of the paintings. In formal art training, one often begins with traditional materials like canvas, linen, and wood. But much of my inspiration stems from street artists to Marcel Duchamp – how might a found object lead to a new body of work? Currently I'm working on a large body of work based on the poetry of Luke Bradford. The poems inside his latest release (Abacus) are so intensely cinematic! I had picked up a handful of vintage film canisters waiting for the right project, and now, there are three pieces under way thanks to this glorious combination. 6. Are you professionally trained in this technique? Or is this skill something you've developed on your own? My degree is in painting, and yet I spent most of my career as a graphic designer. So, the answer to your question is "both," because the skills I was able to hone in college led to feeling like a true craftsman. The design career, however, was built on creating logos, illustrations, and other marketing materials which really pushed my creative problem solving. I was constantly constrained by having to embrace the abstract requests of, say, a healthcare company, who wants their website redesign to make their patients feel more secure – but in a sophisticated place of care. How does one create a virtual environment that makes new and current customers feel a specific way? Now, these thought experiments drive my thought process whenever I discover a new set of words that inspire a new idea for a painting. 7. Is there a favorite piece that you personally use in your home? What do you use it for? The painting that is highly coveted and rarely allowed to leave the house is the very first piece I ever created in what is now my geometric abstract style. We were living in Boston and had just moved into a new apartment in Jamaica Plain. "JP", it's filled to the brim with color and funky houses. I was really inspired by my surroundings when simultaneously, we had a need for some sort of art to be placed above my husband's midcentury radio console. Usually I would never make the time to actually make something, but this was different. I created three studies in different styles and the geometric version won us both over. "Morse Frequencies" is now the first painting visitors see when they walk into our living room in our home in Exeter, RI. 8. Do you create stickers or apparel of your illustrations? If not, do you plan to? I have a Society6.com shop where many of my originals have been translated into a digital format that allows me to offer apparel as well other home goods, including stickers! The incredible thing about Society6 is that it's always amazing to see who has purchased a comforter of one of your paintings. ANYTHING IS POSSIBLE! Stay warm and cozy my friends. 9. With your multi-stepped process, you've mentioned that you're always looking for ways to work more efficiently so you can have more creative freedom. What would your advice be to a fellow artist who wants to work more efficiently but is wary of adding shortcuts or lessening the one of a kind quality behind their work? Oh my, what a wonderful question. First, I'd say, take a step back. Ask yourself, "How might I remove any barriers or things that keep me from truly creating the most meaningful work?" For me, I recognized that I was constantly hand-mixing the same tones over and over again. Clearly my color palette wasn't going to change for a while, therefore I moved to pre-mixing my palette into larger air-tight containers. Second, I started to work on 4-5 small pieces at a time. I loved being able to rotate them in and out, but hated how much I was sitting (sitting is the new smoking, right?). 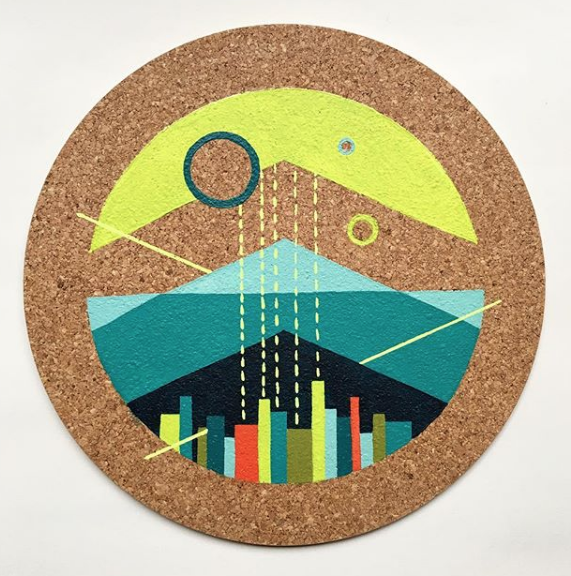 In response to this, I built a cork-board lazy-susan so that I could stand, pin smaller works to said board and rotate them around while painting. 10. Dream collaboration? Can be a specific person, general person, company, etc. What would you create together? Oof. My dream collaboration would be to create the album art for Bonobo and hopefully feed that into some of the digital animations he uses when playing live. It would be MIND BLOWING to sketch while they're still finishing up the next album, pull in lyrics and sounds for inspiration, and do a live show / gallery pop-up combo in the same night. Lordy. I might need a paper bag to breathe in just thinking about this. 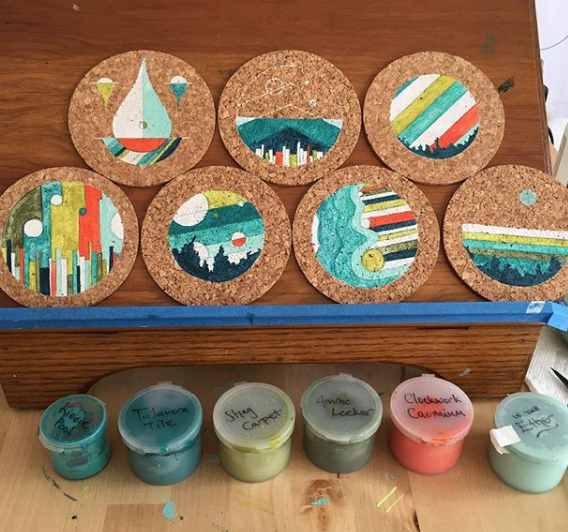 See more of Stacey's work through her Instagram! Today's interview is with artist Cindy Tischer of Mabel's Mugs. 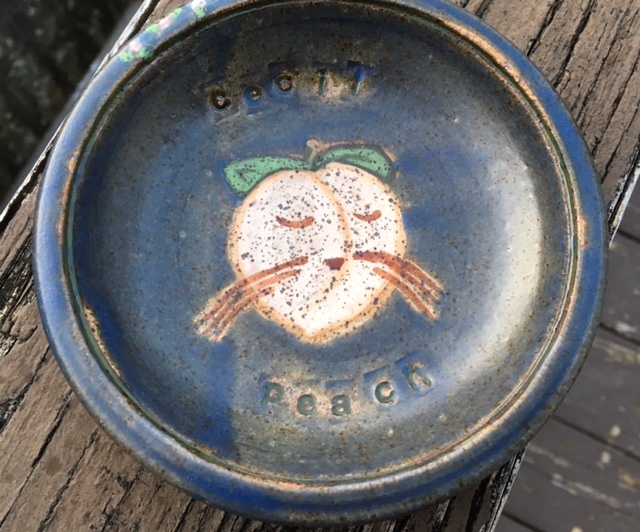 Cindy's pottery is earthy yet vibrant. Each piece adds beauty (and a smile) to everyday activity. Her spirit is just as vibrant, and she uses her pottery business to support a cause she feels strongly towards, animal rescue. We are so happy to have Cindy returning to the Field this summer! 1. Tell us a bit about why you chose the name "Mabel's Mugs" for your business! 2. How would you describe your aesthetic? Do you find that there are consistent themes or colors in your pottery? People have described my work as "rustic and primitive". I'm learning with every piece I make so I like to think of it as more light hearted and fun. I make functional work, it knows it has a job to do, but it doesn't take itself too seriously :) I tend to favor the earth tones and deeper, rich colors. 3. You create using both wheel and hand building techniques. What do you think is the main difference? Time. Hand building (simple forms) is a much quicker process. 4. Do you have a professional training background or did you teach yourself your craft? I do not have a professional background or degree in Ceramics. I started late when my children got older. I have taken classes at the Guilford Art Center and Wesleyan Potters. I am a long time (and current) student of Nancy Johnson Mercado, potter extraordinaire & clay guru of Fire Witch Pottery. There is so much to learn in ceramics! I am learning the business and marketing and design as I go too! 5. Where do you find inspiration for the cheeky phrases often incorporated into your work? Social media, politics, advertising and family are all fair game. I'll have more freedom to create the "cheeky" ones when my own studio is finished! 6. Do you create custom work for customers (or pet owners;)? My rescue Mom/Dad mugs are also fun customized pieces to work on, as are mugs or wine goblets for engaged couples. 7. What is important to you when it comes to a workspace or studio? Space and light of course. For inspiration I have pots that my children made when they were very little and pots that I've collected from artists who I really admire. 8. Do you have a favorite piece you've created that you personally use in your home? My favorite is a set of 2 simple little cereal size bowls. They are a warm pine color and the glaze broke cream colored on the rim, they have the appearance of being salt fired. I call them my "Charlie Brown" bowls because no one wanted them. I love them and use them daily! 9. What would your advice be to a fellow artist who wants to incorporate a passion or cause into their work? Pick a cause you are passionate about. Mine is animal rescue. Bring materials about your cause to your shows. Be prepared to talk as much about your cause as your art. I have a donation jar and also donate a portion of any sales to local rescue groups. Most people have no idea of the scope of need for rescue. Best show moment ever; I was doing a show in a church basement, very little traffic or sales. But one lady came by, who had recently lost her dog and she saw the adoption info I had on a dog named "Diamond". She wasn't looking for a new dog but the stars were aligned and she adopted Diamond and became a huge supporter for her rescue group! I am so grateful for having a part in that happy ending . Interesting question. Well.... My pottery dream crush is Bill Van Gilder. Bill is a master potter who's work is functional and beautiful and his how to videos are informative & amazing. I love that he is so unpretentious , he always says, "there are many ways to do thus and such... here's how I do it".... I'd love to do a series where the sales would fund spay and neuter efforts and educate people on the importance of them. 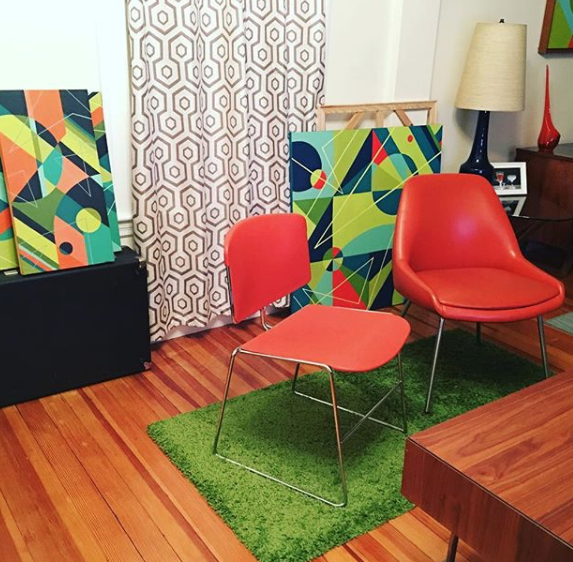 See more of Cindy's work through her Instagram!